On exhibit at the Aurora Hills Branch Library, September 18 - November 30, 2018. Dr. Sharmila is a full time medical doctor in Sri Lanka, where she has had successful art exhibitions and sales in local galleries. She has accompanied her husband to the United States this year, while he studies at Defense University, Washington DC. They are residents in the Crystal City neighborhood. 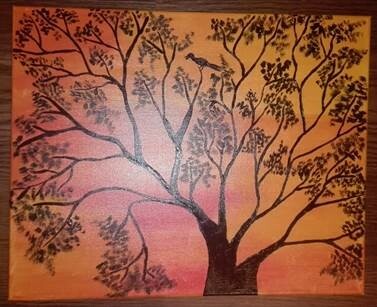 Dr. Sharmila uses her spare time to create beautiful art on canvas. This is her first exhibition in the U.S.